AVALON Hollywood’s CONTROL Friday is back on April 26th to host rich euphoric beats and vast futuristic soundscapes from ANTISERUM and BENZMIXER. ANTISERUM’s dynamic style of West Coast bass music consists heavily of hip hop, drum and bass, reggae, and heavy metal, with his performances always packed with solid energy. He continuously defines the sounds of today by producing meticulously crafted sounds, as well as solidifying himself as a prominent figure in hip-hop inspired electronic music. The response to ANTISERUM’s music from the DJ community speaks for itself by collectively receiving support from Skrillex, Diplo, and Bassnectar among others for some of his releases this past year such as “Trippy” and “Bangladesh”. Next up, AVALON will be welcoming the Florida native - dubstep producing BENZMIXER. Striving to always deliver something new, he has harnessed his creative skills in producing melodic chest rattling beats. BENZMIXER is a cutting-edge artist who receives active support from 12th Planet, Da Force, and many more. Don’t miss this night full of innovative and energetic bass sounds. 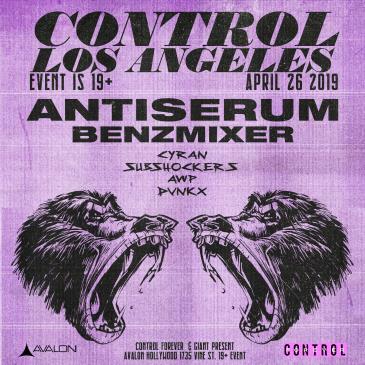 Get your tickets to see ANTISERUM and BENZMIXER at AVALON Hollywood on Friday, April 26th!